Never in history have so many people lived in urban areas (that is, outside rural areas). 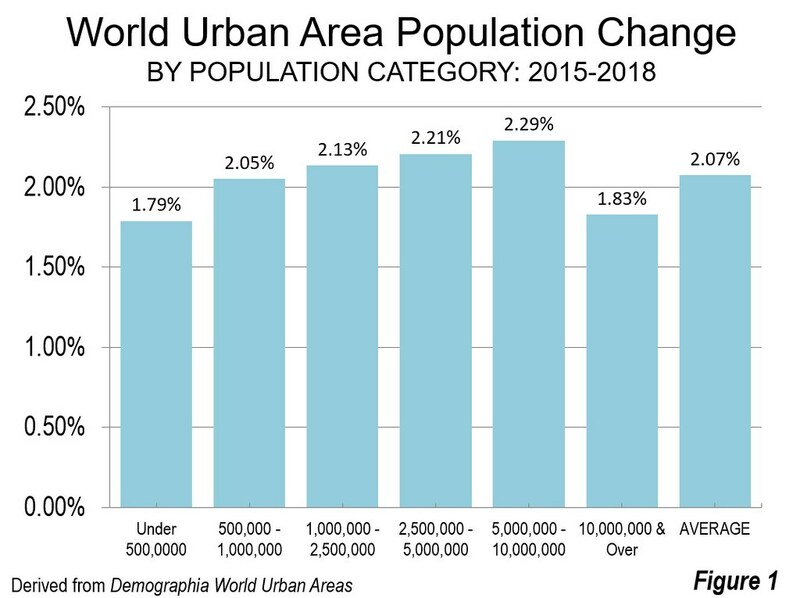 There are now 37 megacities (urban areas with more than 10 million residents) in the world, according to the 14th Annual Demographia World Urban Areas. This represents a substantial increase over the past century. But most urban growth, contrary to popular belief, is not taking place in megacities but in large urban areas that have not achieved megacity status. One hundred years ago, there were no megacities. It was not until 1930 that the first megacity emerged, New York. By that time, London had reached 8 million residents, having been the largest urban area in the world, passing long-time leader Beijing about 1825. London held the top spot until passed by New York in the 1910s. Tokyo-Yokohama became the second megacity, reaching 11.3 million in 1950, just behind New York’s 12.3 million, according to United Nations data. By 1960, Tokyo-Yokohama had passed New York. Meanwhile, London had been left far behind, reaching megacity status only in the 2010s. London’s growth stalled because of planning policies that forced nearly all growth outside a Greenbelt. The metropolitan area (labor market), which includes areas separated from London by the Greenbelt, has experienced healthy growth since that time. 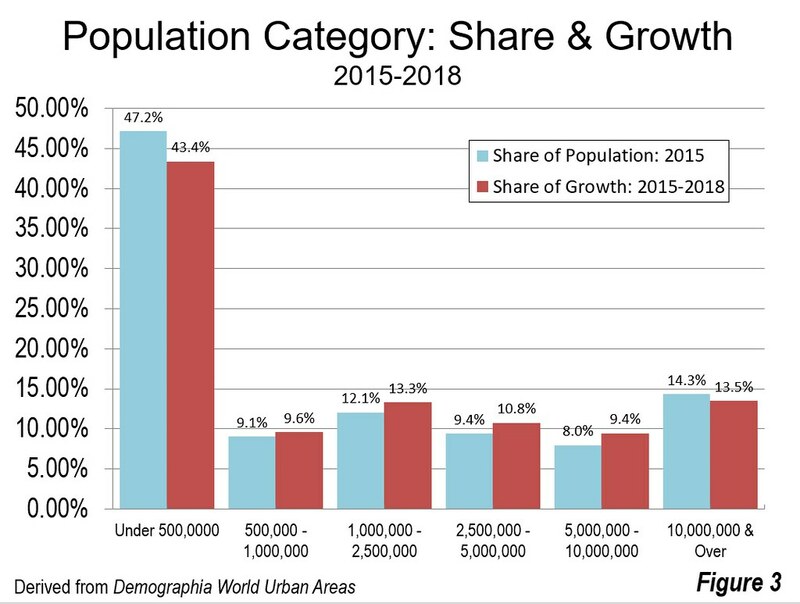 This article describes the results of a three year analysis of estimated population growth by population categories from 2015 to 2018, using data from Demographia World Urban Areas. The composition of each population category is kept constant based on 2015 data (urban areas are analyzed within their 2015 population category). There are plenty of good reasons why megacities have caught the attention of the media and researchers. Moreover, the continuing increase in urbanization has been of great interest. According to the United Nations, only two percent of the world’s population was urban in 1800. The world is now more than one-half urban. It is estimated that, on average, world urban population grew 2.07 percent annually between 2015 and 2018. But, despite the urbanizing trend, megacities are not the fastest growing. Indeed, they tend to be among the slowest growing in the world. Over the three years of this analysis megacities are estimated to have grown only 1.83 percent annually (Figure 1). The greatest growth was among urban areas with 5 million to 10 million residents, the category just below megacities, with a 2.29 percent annual growth rate, 25 percent above that of the megacities. Each of the smaller categories grew more slowly but faster than the megacities. The 2,500,000 to 5,000,000 urban areas expanded by 2.21 percent while those between 1,000,000 to 2,500,000 grew 2.13 percent. The urban areas with 500,000 to 1,000,000 population grew 2.05 percent. Only the urban areas under 500,000 population grew slower than the megacities, with 1.79 percent annual rate, slightly lower than that of the megacities. All of the population categories from 500,000 to 10,000,000 experienced gains in their share of the world urban population. The largest gain was 1.03 percent, from 2015 to 2018 in the “near-megacities,” from 5,000,000 to 10,000 population. The megacities lost 0.33 percent in share over the three years, though less than the minus 0.44 percent loss by the urban areas with fewer than 500,000 residents (Figure 2). Another surprise may be that, among the population categories, the smallest cities (under 500,000) contain by far the most people. In 2015, the smallest cities accounted for 47.2 percent of the world’s urban population, more than three times that of the megacities. But, these urban areas accounted for only 43.4 percent of the world’s urban growth (Figure 3). At the same time, megacities accounted for 14.3 percent of world urban population in 2015 but their population growth has lagged, at only 13.5 percent of the total. The population growth rates in each of the middle categories has been greater than their population shares. 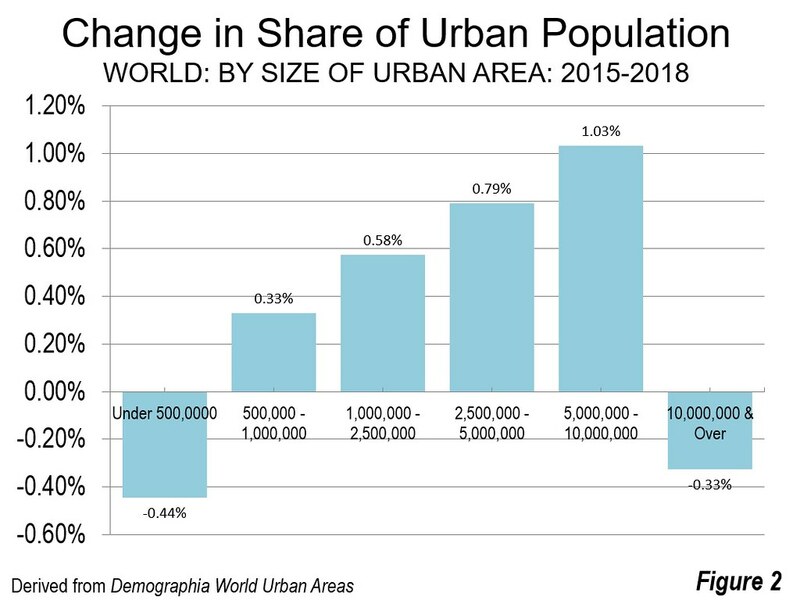 Further, even though more than half of the world’s population lives in urban areas, only one-half of that number live in the larger urban areas. Six years ago, an examination of world urban area sizes indicated that the smallest was Godegård, located in the Motala municipality of Sweden, with 200 residents (See: “What is a Half-Urban World”). According to the 2018 update of Demographia World Urban Areas the median urban resident in the world lives in an urban area with approximately 645,000 residents, a distinction shared by Tyumen, in the Ural District of Russia, and Cape Coral, Florida in the United States. These urban areas have approximately are tied as the 831st largest urban areas in the world. The percentage of people living in megacities could increase in the future, even if the population of the present megacities grows at a lower rate as a result of smaller cities that may reach the 10 million resident mark. There are 14 urban areas that have between 7.5 million and 10 million population, and another 35 have more than 5 million. Among them, these near-megacities appear to be the most likely additions to the ranks of megacities in the near future: Bogota, Chongqing, Hanoi, Hyderabad (India), Johannesburg and Luanda. Photograph: Chongqing: Continuously built-up urban area soon likely to exceed 10 million (by author).